We're nearing the end of the school year and school activities are leaning towards the less serious. Yesterday my youngest daughter took part in a triathlon. All the children in the first year of education at her secondary school (most are now thirteen) were given a pink sheet of instructions with directions to a running track and swimming pool roughly a 35 km round trip distance. It is, of course, expected that every child will have arrived at school by bike and be able to take part in the activity. The instructions start "at the front of the school, by the cycle parking". Part of her school's cycle parking is shown at the left. 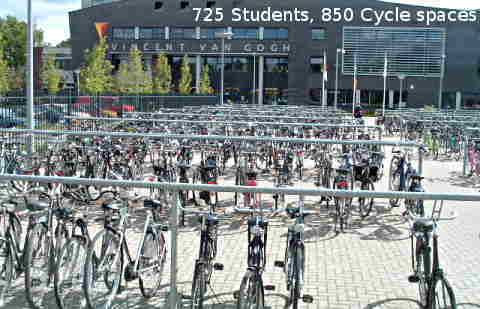 There are more cycle parking spaces than students. Perhaps some of the more sporty minded children rode quickly, but I'm quite sure that for many children the journey was made at a more relaxed pace while talking with friends. At secondary school, constant supervision isn't usually necessary, but during the triathlon there were teachers out on the route at controls every few km to make sure no-one was taking a short cut ! Last year my daughter was still in primary school at this time of year. The last primary school cycle trip was a 150 km cycle camping tour. At that age they were accompanied by teachers or parents at all times when cycling. Explanatory captions on this video are only visible if it's played on a computer and not on a mobile device. While we knew that children cycled to school before we moved over here, we had no idea about the number of other school trips that they made by bike. School bags dangling from flag poles are a common sight right now. When school is over, this is a way of announcing the fact. While most live closer, some secondary students ride a 40 km round trip each day just to get to school. It's another blooming world... Here we get schools banning children from coming by bike! And some which are actively encouraging it, I'm glad to say, but not nearly enough. Another great post! I am a UK primary school teacher and was amazed by the video. I wish all UK schools could work to the safety standards of the Dutch schools. I felt moved to post your video on my blog and make further comments. About the bags and the flags. Thats only when you pass your exams and when your done with your secondary school. Very interesting and informative blog! Thanks for all of the information.